5) The child is no longer excited about getting new toys in the mail. 4) You get out the camera and the child automatically stops to pose. What would you add to these signs? forgot one, your teacher calls you in to discuss your child not knowing their name. Instead they are constantly writing their blog nickname. Eeek. Yep that happened here. Or how about your child knows your blog address more than they know their home address. Oh yes! 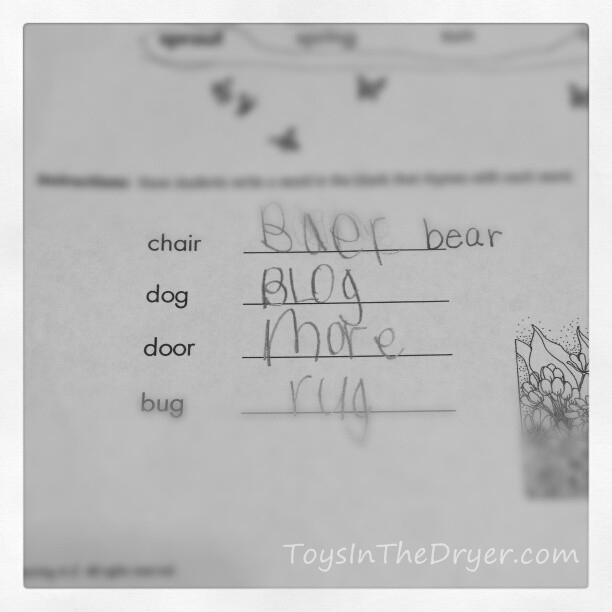 Nutty writes both her real name AND Nutty on her homework. In her defense, Nutty is her real nickname 🙂 The blog address is funny though! Too cute! Mine aren’t old enough for that, but I’m horrified that my 2 year old constantly brings my my cell phone. Like he believes it’s SUPPOSED to be attached to my hand! Apparently I need to reconnect with the “hands free mom” blog again. I hear ya. My girls often say stuff like “mom, did you remember your phone?”. Sad. Hilarious! So true though. My 4yo started taking pictures with my phone. I skimmed through them and saw that he had taken pictures of food. I asked him why he did that and he said that I made good macaroni and cheese and that I might want to put a picture of it on the blog. LOL. How cute is that?! I think you have a future food blogger on your hands! LOL, so true! My kids say what did the mailman bring for you to work on today. Love the pose one, that’s cute.